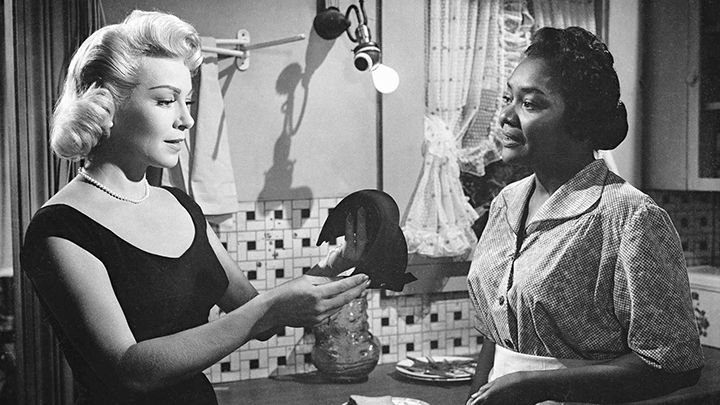 Juanita Moore and Susan Kohner in Douglas Sirk's "Imitation of Life" (1959). When I was 4 or 5, the 1959 film “Imitation of Life” came on TV. It had two little girl characters, so I figured this must be a movie for kids. But I couldn’t figure out what was going on, so I asked my mother to explain it. She did her best. She told me it was about a black girl “passing” as white. Then she tried to explain what “passing” meant, and I was really out in the reeds. I must have goofed it up somehow, because I thought the girl’s mother was encouraging this thing called passing. 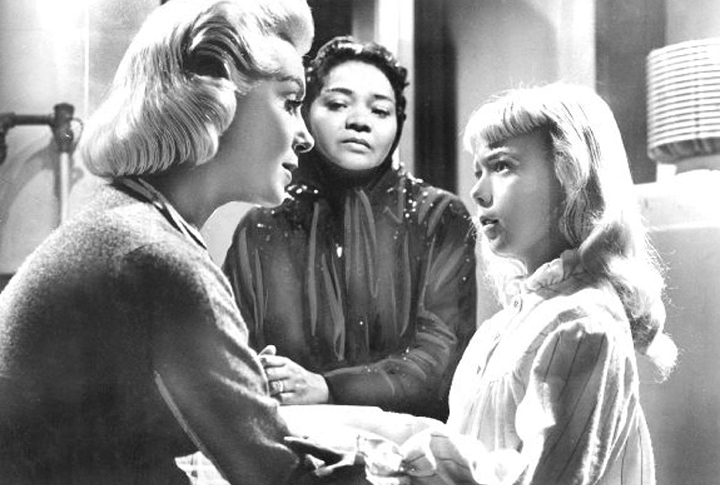 I learned I was wrong when, as an adult, I finally watched Douglas Sirk’s film in earnest. This is a sometimes sweet, sometimes painfully dramatic, sometimes cliched Hollywood film that you’ve got to credit for being progressive for its time. Annie (Juanita Moore), Susan (Terry Burnham) and Sarah Jane (Karin Dicker) under the boardwalk. 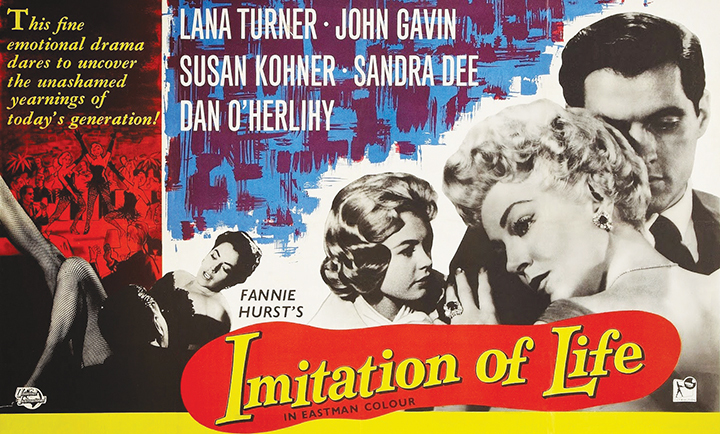 “Imitation of Life” opens on a sunny summer day at the Coney Island beach. We see Lora (Lana Turner), a blond woman with every bleached follicle sprayed into submission, frantically searching for her daughter. 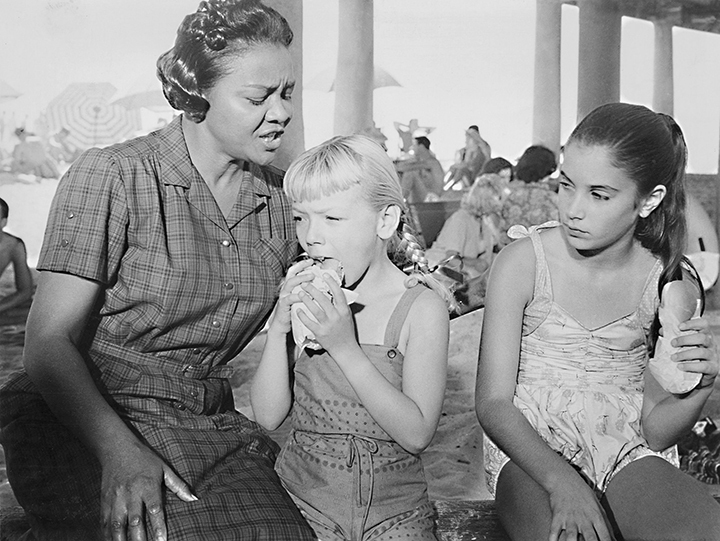 Meanwhile, under the boardwalk, a black woman named Annie (Juanita Moore) is giving hot dogs to two little girls, blond Susan (Terry Burnham) and brunett Sarah Jane (Karin Dicker). We correctly assume that the blond girl must belong to Lora. “All her life,” is Annie’s reply. Lora can’t help but register surprise when told that Sarah Jane is Annie’s daughter. Annie assumes that the impeccably attired Lora has money, and offers to work for her as a domestic. Lora first declines the offer. (We find out later that she is barely making the rent.) But when she overhears Sarah Jane asking Annie where they’re going to stay that night, Lora makes an on-the-spot decision that will affect the rest of her life: to invite Annie and Sarah Jane to her home. Susan is thrilled; she has a slightly older playmate, at least for the night. Lora (Lana Turner) and Annie (Moore) in Lora’s cramped NYC walk-up. Home is a cramped NYC walk-up. Lora, a struggling actress, warns Annie that she has no money to pay her. But Annie is unfazed. She just smiles and takes over, finding little ways to lighten the financial burden: taking in washing, licking envelopes, making deals with the landlord and milkman. 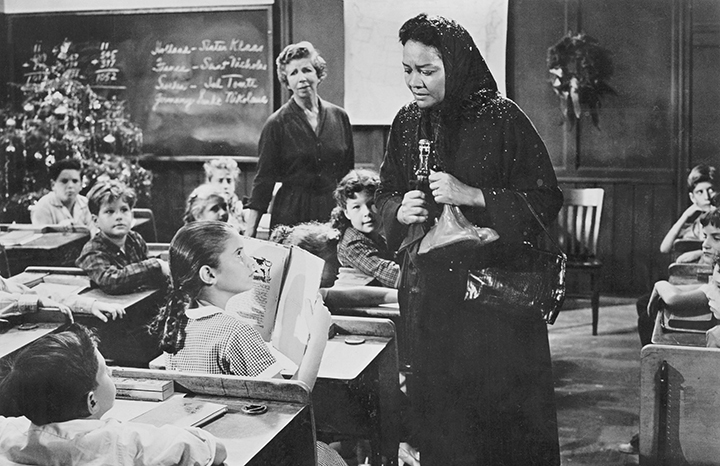 Annie brings galoshes to Susan in school, to the girl’s humiliation. Something is brewing behind Sarah Jane’s fixed expression. Her feelings become clear when, on a day that suddenly turns snowy, Annie totes the girl’s galoshes to school. Like Peter denying Jesus, Sarah Jane tries to hide behind her book. “Why do you have to be my mother?” she later says. “It’s a sin to be ashamed of what you are,” Annie says. Lora tries to explain to Susan why Sarah Jane is upset. Lora eventually moves into a beautiful, secluded spread outside of the city, and becomes a movie star. Through it all, Annie remains in her employ. Even though the employer/employee lines are drawn and respected, beneath it all, Lora and Annie are more like sisters. 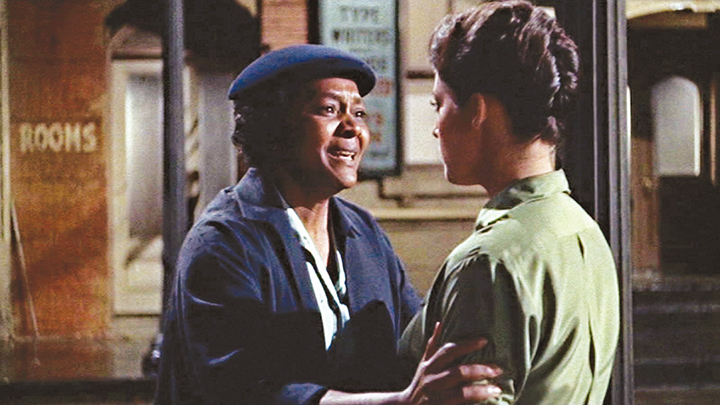 Annie pleads with grown-up Sarah Jane (Kohner) to come back home. One scene in particular still draws gasps: when grown-up Sarah is confronted by her boyfriend (then-unknown Troy Donahue) after he hears talk that she is black. “Is it true?” he demands. “Is your mother a n*gger?” He brutally beats her — I counted six hard whacks to the face — and leaves her on the street, bloodied and crumpled. Enough synopsizing. Just wanna add that the last 10 minutes will wring your tear ducts. 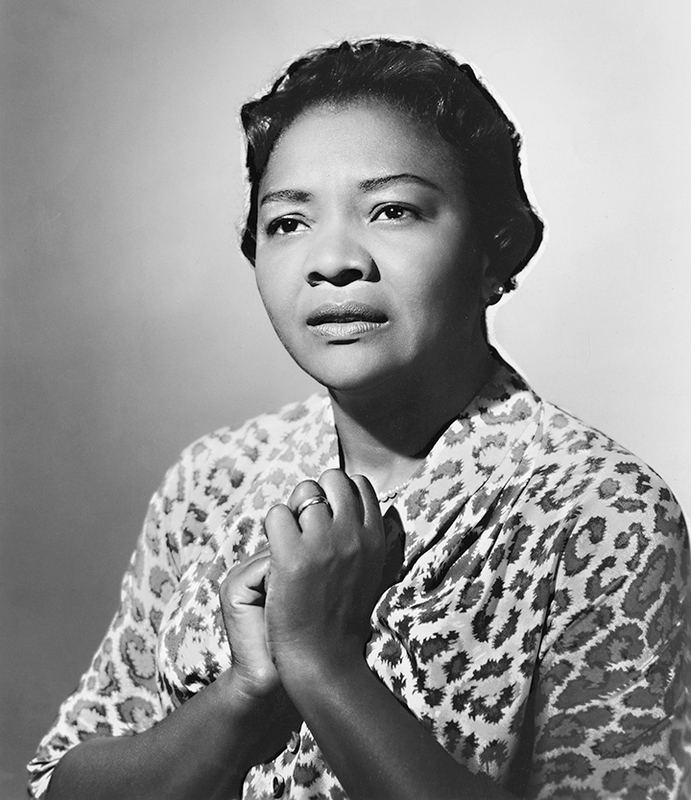 A portrait of Moore as Annie. The actress was nominated for a Best Supporting Actress Oscar. 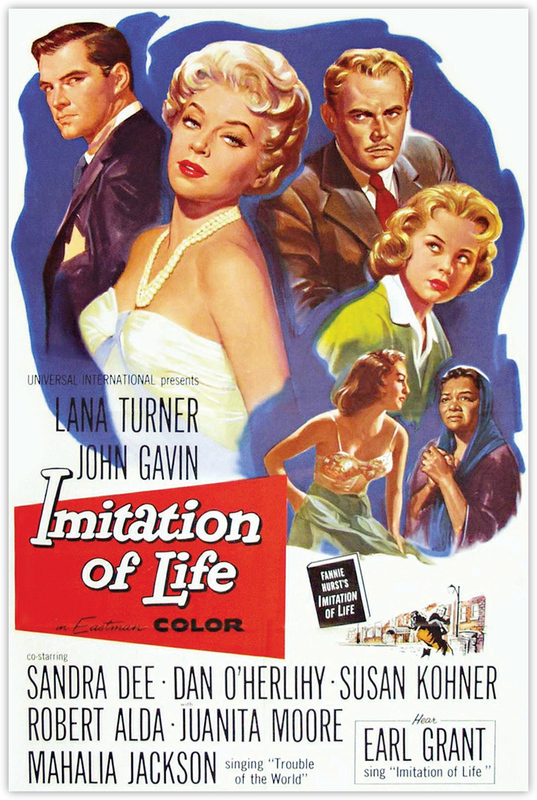 Below is a “Classic Critique” segment on “Imitation of Life” by film buff Mercedez. (Her Kohner imitation is a riot.) Gotta love it when the young folks pay respect to the old movies.